We're excited to announce our new Interlocking Surface Tiles made from a special formulation of recycled tires and polypropylene resin. Designed to be one of the longest-lasting, highest valued recycled surface systems available, they're the smart new solution for your greenhouse, bench, production area, event surfaces, and more. Easy to clip together and install by hand, our Interlocking Surface Tiles provide stable surfaces even in typically slippery and puddle-filled areas. 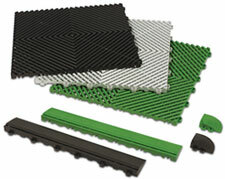 And since they're lightweight, unlike conventional rubber mats, they're easy to clean and maintain. Plus, they're chemical resistant and withstand heavy loads. Separate ramped-edge pieces finish-off our Interlocking Surface Tiles in style, allowing a safe transition from other surfaces.